1" x 2" (same as the button version) with a strong magentiic backing. Sheet of 18 envelope labels. Each triangular label is 5/8" on each side. Fits well on checks, envelopes, postcards, notecards, snapshots, foreheads, faces, flashdrives, cellphones, iPods, etc. 11"x17" on white card stock. 1.25" Button • Out-of-print, few left. Now that marriage equality for gay and lesbian U.S. citizens has been made legal in all 50 states (6/26/2015) this button is ready for retirement. There are only a couple of dozen left as of July 2015 . When they are sold, this one will not be available again. Most issues don't have such a clear resolution as this one. T-Shirt: "In Germany, first they came for the Communists..."
Union screen printed on union made Black 100% cotton T-Shirt. The words of Pastor Martin Niemoller from his journal. He was imprisoned in a Nazi concentration camp during World War II for resisting Naziis. This is an eloquent advocacy of solidarity among all who are oppressed – as true today as it was 85 years ago. 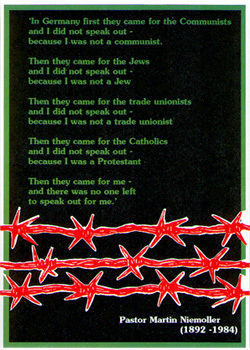 This is the original version as he wrote it: "In Germany they first came for the Communists, and I did not speak out - because I was not a Communist. Finally a stylish t-shirt that's made for women. These new t-shirts are dyed in Vermont in an assortment of gorgeous colors. They have a scoop neck and fit people with hips. We plan to offer many of our old designs in this style. Right now look for it in our "T-Dove," "Margaret Mead Quote (SCOOPT-MMQ)," "Wage Peace (SCOOPT-WP)," and "Don't Postpone Joy (SCOOPT-DPJ)." "Whoever destroys a single life destroys the entire world. Whoever saves a single life saves the world entire." 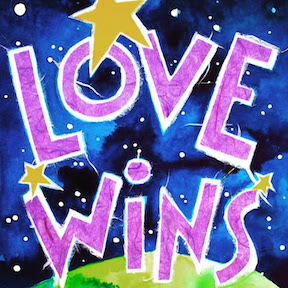 Design by Amy E. Bartell (A.E. Originals ©1996). 100 pound card stock. 12"x23". 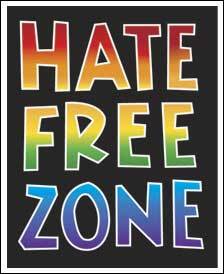 Self Sticking Embroidered Patch 2" x 3"
• 3' x 2' banner length rainbow flag, sewn nylon with brass grommets, made in U.S.A.
• Set of four LGB-themed Post Cards. Book: "Things That Make a Gay Heart Cry"
Full color • laminated • imported from England (published by New Internationalist) • approx. 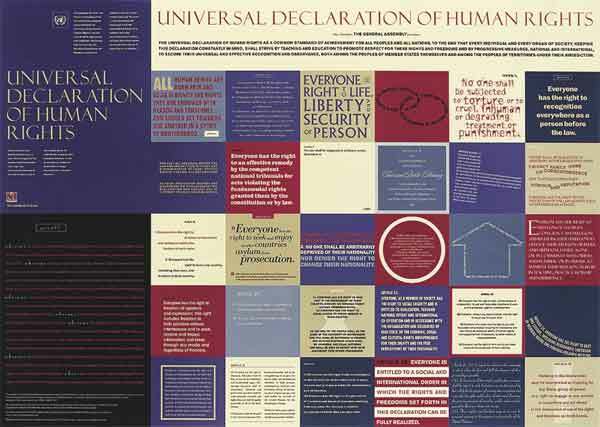 22.5" x 31.5"
Wall chart with the text of the Universal Declaration of Human Rights. A 1997 survey fund that three-quarters of Americans had never heard of this document, the Universal Declaration of Human Rights. 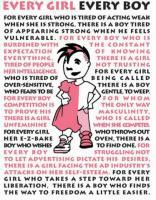 It isn't taught in schools. Yet it is perhaps the most important document of the 20th century agreed upon by 155 nations throughout the world. 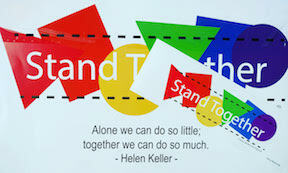 Help increase awareness of it and the issue of human rights at home and around the world. This declaration reaffirms a commitment by individuals, communities and governments to principles which help shape the world. Eleanor Roosevelt, a member of the commission that drafted the Declaration, said of it in 1948: "It is not a treaty...[in the future] it may well become the international magna carta..."
• Click on title for more of the back story behind this Declaration . . .
2" x 2" x 2" triangle with rounded corners and safety pin on back. Told through the eyes of Kelli Peterson, a 17-year-old high school student in Salt Lake City, Utah, OUT OF THE PAST explores Kelli's history-making experience of forming a Gay-Straight Alliance in her public high school. The protests, legislative battles and national media attention serve as a modern counterpoint to the history of a human rights movement. "We were up against a solid wall of ignorance," wrote Henry Gerber of his efforts during the 1920s to launch the first gay rights organization in the United States. The struggles and triumphs of Gerber along with the incredible stories of civil rights activist Bayard Rustin and other important figures of American History are profiled in this powerful film. from lyrics by Si Kahn and a quote by labor activist Peter Rachleff. 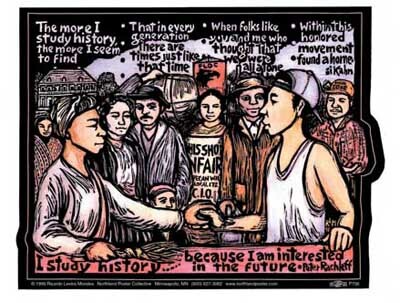 This print drives home the importance of history in social change activism. A people or a movement without awareness of its own history are lost and destined to repeat the mistakes of the past. 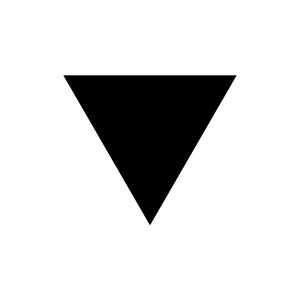 1.25" button • The black triangle was the symbol the Nazi's demanded lesbians to wear in public as a sewn-on patch during the Holocaust in World War 2. 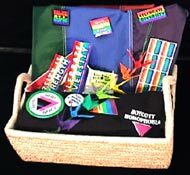 Like the pink triangle for homosexual men, the black triangle has long been used by lesbians as a symbol of resistance to repression. A conversation starter for this who don't know what it means. 1.25" button. Out-of-print, only a few left. 1.5" Button • "Love Trumps Hate"
© 1990 Donnelly/Colt • Our most popular pin-backed button is now available as a two-=piece magnet-backed pinless button in the same size as then original. IT has a powerful magnet on back and a separate piece of metal to put on the inside of a shirt or thin sweat, that holds it firmly in place, so you don't have to poke a hole through the fabric.